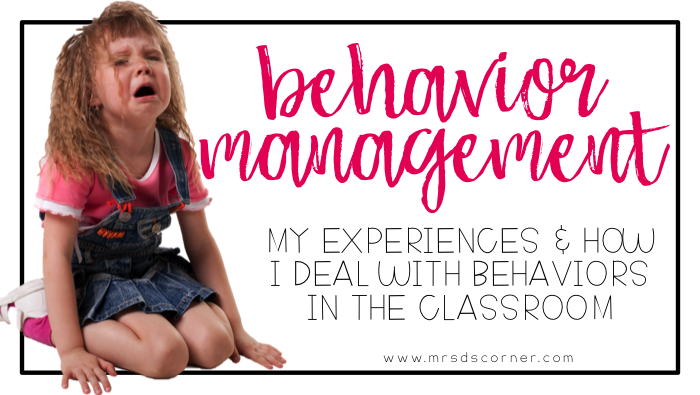 Behavior management in any classroom is a tough thing to handle, and to some teachers it’s natural… and to the rest of us, it doesn’t come as easy. But we handle our own and do what works best for our classroom and our students. This post contains affiliate links for your convenience. View the full disclosure policy here. And honestly, ya know… since we’re being honest… no two school years are the same. What works one year may absolutely bomb the next year, and that’s okay! It’s something that keeps us on our toes and is good for our brains. But that doesn’t mean us teachers don’t struggle with it. Let me share my journey with you a little bit. After graduating in the spring of 2010, I got a great job as a 7th grade math co-teacher for the upcoming school year. When I say great, I really mean it. The school was amazing, the kids were awesome, the people I worked with were above and beyond brilliant (many of whom I am still in contact with today). But with the great school came my first great lesson. There’s always one student who pushes the limits and that was G. G was consistently getting detentions and suspensions, which gave me more paperwork as his special education teacher. During my first year I got to write my first official behavior management plan on G, along with a Functional Behavior Assessment and Manifestation Determination… well multiple MDs. Ha! Thankfully, I had many teachers and therapists who helped me through it and guided me, partially making me more of the teacher I am today. I remember a teacher telling me that I had “the worst student in the school” on my caseload – G. Funny thing is, G was a great kid! He was so smart, he thought things through (even if those things were how to escape a room or sneak out of the building without being seen), and I learned a lot from him. I remember telling myself, “Alright, if I can handle this kid, I can handle any kid!” HA! I wish I could go back and tell myself to stop being so naïve. G was cake compared to what was coming for me. Let’s jump ahead 3 years to one of the urban charter schools I worked in as an elementary resource teacher. It was one. tough. gig. I did it for 3 years and it was tough. Now I’m a tough teacher and I can handle a lot, but there were days when I would just go home in tears. I would feel totally defeated, but I still got up the next day and tried again. I was always determined to get through to my students and teach them something, even if it had absolutely nothing to do with the day’s lesson plan. That’s when I came up with this behavior management system. Every Friday, we would have Fun Friday. This was a 15-30 minute period during each class where my students could play educational games, like Blokus or Sudoku. I started out using Fun Friday as a reprieve, which was an awful idea on my part. Students 1, Mrs. D 0. After learning from the mistake, I decided to make these desk cards for each of my kiddos. Now my kids had to earn Fun Friday, which they thought was awful because they actually had to do work and behave. BUT the system was easy to manage, simple to explain and understand, and it worked! After the first week of testing it out, my students realized that their actions were causing them to lose points, which in turn meant they might lose out on Fun Friday. So they started managing their own behaviors. Imagine that! Point for Mrs. D.
instruction), the student got a 1. If the student did an average job, s/he got a 2. If the student went above and beyond, participated in class, and did his/her work to the best of his/her ability without complaints or whining, the student got a 3 (the best score). At the end of the day on Thursday, the student needed 10 points in that class for the week to earn Fun Friday. Since the papers were taped to the students’ desk tops, each student was able to keep track of their own points and tally up what they needed if they had an off beginning of the week. What did I do if a student lost Fun Friday privileges on Tuesday or Wednesday? I always gave them the opportunity to earn it back with “perfect” behavior. I know, I know… how unethical of me! A student already lost the opportunity, why give him a second chance, right?! Wrong… if I had not given the students a chance to earn points back, their behavior would have continued on a downward spiral for the remainder of the week, making it that much harder for me to teach and for the other students to learn. Jedi mind tricks! I mastered them! The best part of this system (even more so than it working) was I had data. Weeks and weeks of data for when IEP writing needed done, for Parent Teacher conferences, for behavior plans. I kept each student’s weekly point chart in a file folder. If a parent questioned something, I had behavioral data to back it up. *Disclaimer: students still called out, got out of their seats, and were sent out of the classroom. We all have off days and that’s completely okay. But behaviors decreased, intensity of behaviors decreased, the length of behavior outbursts decreased, and my students started managing their own behaviors. 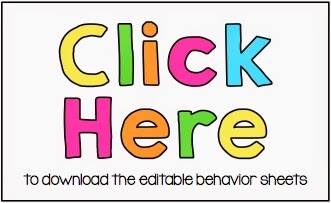 To help you with any of your behavioral management needs, you can get these editable behavior point charts here for free, just click on the picture above. There are 6 versions included (with homeroom and without; and with 2, 3 and 4 classes). You can edit the rules and notes at the bottom as well. 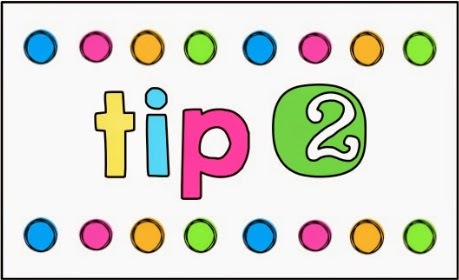 What have you found works best in your classroom to help manage behaviors? Tell us in the comments below! I love the idea of Fun Friday and love that your children have to earn it! I can totally see myself working this into my current classroom management system! Thanks for the freebie to get me started! 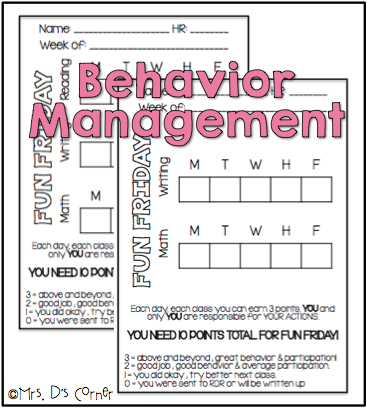 I am super excited to be read all of the tips and tricks with behavior management this week! Thanks for hosting this wonderful linky to get us all ready to go back to school! Great post! I like your point system! I agree with you about allowing the students opportunities to ear their points back. Some teachers are against this theory but what I've seen is that if they can't earn them back, they "throw in the towel" if they have any bad markings. The balance is tricky though. It's important to make it clear to them that they have to EARN it back and it's not going to be given back because I feel bad. #tugsontheheartstrings I've linked up, I'd love for you to read about what I do in my classroom! Loved your post! I really enjoyed reading about how you manage Fun Friday. What a fantastic way to have ongoing data AND reward students for behavior! I've already downloaded this and am considering trying this out! Fantastic idea! 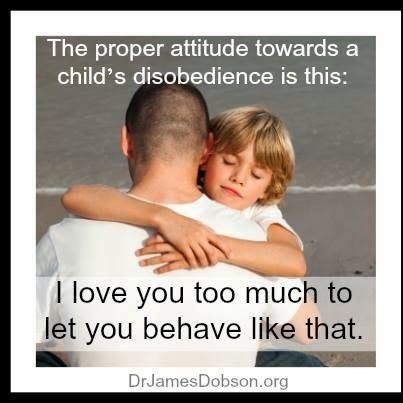 I love the idea of teaching students to manage their behavior….thereby instill self-control and self-discipline. What an excellent way of keeping accurate data throughout the school year. I am a Kindergarten teacher. I have already downloaded the behavior charts and looking as to how I can adapt them. Previously, I have used a card system, I am looking for something new and I have found it. Thank you so much for sharing your ideas. I really appreciate it. 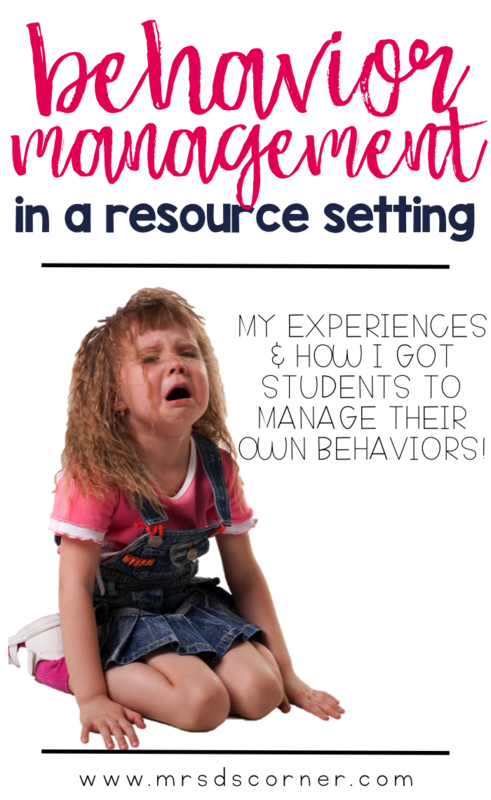 I love your post, and how you have your students take responsibility of their own behavior management. What a great way to have them want those elusive intrinsic rewards!! Thank you so much for sharing, and for hosting such a great linky where we can learn all about the different tricks and techniques teachers all over use for behavior management! I love the ideal of Fun Friday, however, I teach history so what would be a good game that is history related that can be played? I know the ones that you listed are for math.